HomeSHARE: Parents, view the video with your child. How many items can you identify together? What were the items uses? What role did these items play in shaping our history? Week 27 Mr. C is excited to share this idea with the class. As part of our Social Studies and descriptive writing units we plan on “Putting Our City on the Map” in a very interesting way! Watch for more details to come and do the HOMEShare below to prepare! HomeSHARE: Parents, discuss with your child some of his/her favourite places in Thunder Bay. Week 26 Upon returning from the March Break on Monday, Mr. C was excited to announce that he’d be taking the kids on an adventure today, this time to learn about bats in the Amazon rainforest! The students began prepping for their “trip” in their Adventure Logs. HomeSHARE: Parents have your child tell you about the highlights of their adventure. What was their takeaway(s)? Week 23 This week we travelled and learned all about the whale shark with two amazing scientists. View our adventure below! Below is a sampling from our Digital Adventure Logs, including our questions, field notes and take aways! Homeshare: Parents, ask your child to share their Adventure Log with you and have them tell you what their take away was. Week 21 We are looking forward to our next learning journey where we’ll be travelling to meet 2 amazing researchers and one incredible fish…. the whale shark. Join our adventure, live on Tuesday February 28th at 2:30 pm. Just click on this link! HomeSHARE: Parents and students do some research! Come up with 2 or 3 “deep” questions for Simon and Chris (they know more than anyone else about whale sharks)! Week 20 This week we started our #WalkwithChanie Our goal is to walk 1 km each day for 60 days. This is the distance Chanie walked. WE are hoping that 9 more classes or families will join us so we can collectively walk the 600 kilometres that Chanie needed to cover to reach his home at Ogoki Post. Read more about out walk on our blog. HomeSHARE: Parents and students join our walk as a family and please share our idea via social media! HomeSHARE: Parents, visit ‘Walking the Secret Path’ with your child. Have them tell you about Chaine’s story in their own words. Weeks 17 and 18 We are all prepared for prepared for our eighth global learning journey…this time to Iceland to meet Pall Davidson to learn about the receding glaciers. We’ve done our research and have dug deep to prepare some great questions! This will be a perfect tie-in to our Social Studies, global issues study! HomeSHARE: Parents are your child what they have learned by doing their initial research. Can you brainstorm a “deep question” for Pall??? HomeSHARE: Parents work with your child to arrive at a reasonable estimate! This week we travelled to the Bahamas to learn from scientists and divers and explore Blue Holes! HomeSHARE: Parents, ask your child to describe a blue hole! We recently had a google Hangout with Sedna Epic, a team of female scientists, explorers and divers who will snorkel the 3,000-kilometre Northwest Passage for climate change in 2018, .https://goo.gl/stJRQF . HomeSHARE: Parents, ask your child the most important or interesting thing they learned from their learning journey. We have started to explore our world and understand the continents and puzzles by working on World Geo puzzles! Mr. C was incredibly impressed with how well the kids worked together to build the puzzles and how much they were “talking geography”. Upon completion of the puzzles the students picked there countries from three different continents and did mini inquires to find out about each (read more at the Writing wall). HomeSHARE: Parents have your child name the 7 continents. Can they also name one or more countries from each continent? HomeSHARE: What questions come to mind as you watch? We enjoyed an incredible trip to South Africa to visit SANCCOB. We loved Stubby the penguin and learned so much about the biodiversity of penguins and other sea birds. View the EBTSOYP video below to view our class learning and asking some amazing questions! HomeSHARE: Parents, watch part of, or all of the Google Hangout with your child. Discuss something that you learned! We are really looking forward to our next journey, this time to South Africa to learn about how South African penguins are reared at SANCCOB. We’ll get a chance to meet Tamlyn Hardy, Education Director and some really cute baby penguins! Our grade 6’s have been studying all the different types of penguins and their biodiversity and we have all done initial research on SANCCOB and the South African penguin. We are looking forward to yet another incredible learning journey via EBTSOYP! HOMEShare Parents, your child has developed some questions to prepare for our Google Hangout. Have your child share his/her questions with you. Can you come up with another great question together? Your child may have a chance to ask it live, on air! Don’t forget to join us in South Africa !Simply click on this link https://www.youtube.com/watch?v=3joZ-wj81F4 on Wednesday November 9 at 9:30 am EST. This week, our grade 6’s continued to learn about the many different animals from the Galapagos Islands that Joe Grabowski introduced us to during our Google Hangout with (see the video below). HomeSHARE Parents, have your child tell you about a Galapagos Island animal. What makes it unique? We were excited to prepare for our adventure to the Galapagos Islands with Joe Grabowski. We spent time learning more about Joe and the incredible Galapagos Islands. We jotted down important information in our adventure Logs and developed deep questions that we’d like to ask Joe. This learning journey compliments our Science unit, “Biodiversity”. HomeSHARE Parents, view our Google Hangout with Joe and/or ask him/her about it. We learned so much from Alize today! We understand what adaptations are and Alize shared with us some incredible examples of how humans have adapted as our natural world continues to change. We have recorded our learning in our Adventure Logs! HomeSHARE: Parents discuss with your child what an adaptation is and talk about how specific animals have adapted to their environment. On Thursday we had the privilege of having two visitors come to talk to our class about the TBayTel For Good initiative that they are launching. It is all about making a difference in our community! Our class was excited to find out that this year TBayTel will be funding a school project! We will be brainstorming ideas to submit a proposal! HomeSHARE: There’s also a “Good Neighbour” and “Good Community” program. I encourage you and your family to submit your idea! Go M.A.D (Make A Difference)! After reflecting on our first live Google Hangout with Markus (see below), we wrote well developed, strong sentences to share what most resonated with each of us. We will now be working to write well developed paragraphs to elaborate on our thoughts. HomeSHARE: Parents, have your child tell you which sentence they wrote. Have them explain (elaborate on) what their sentence means. We had the great pleasure of meeting Markus Pukonen live from Hawaii today (Monday September 19) via Exploring by The Seat of Your Pants! To prepare for our meeting, we researched and developed strong questions to ask Markus. Markus is circumnavigating the entire planet for 5 years without the use of a motor! Markus is traveling 80,000km around the planet without ever using a motor because he believes a sustainable world future is possible. In 8 months he has canoed, trimaraned, hand cycled, pogo sticked, bicycled, tricycled, skied, rafted, kayaked, SUPed, and danced his way across Canada, from Toronto to Tofino. HomeSHARE: Parents, watch some or all of the video with your child. Discuss one thing you learned from Marcus. We were are excited to join classrooms from around the world as we travelled with Exploring by the Seat of Your Pants to visit the Canada-France-Hawaii Telescope near the summit of Mauna Kea mountain on Hawaii’s Big Island at 2:30 pm. on Wednesday. Before watching, we worked on developing deep and rich questions, while we watched the live streamed event we took notes in our Adventure Logs as we jotted the most important information and main ideas. Below is the hangout! This year, not only was I excited to welcome my students back to the new school year; so were 100+ educators from around the world! We have spent the first three days reading through all the great tweets and digesting all the fantastic pieces of advice and words of wisdom. I challenged the kids to take notes to keep track of the tweets that most resonated with them. This coming week they will share their one favourite tweet. ***Parents, feel free to view the tweets with your child and pick your favourite as well. 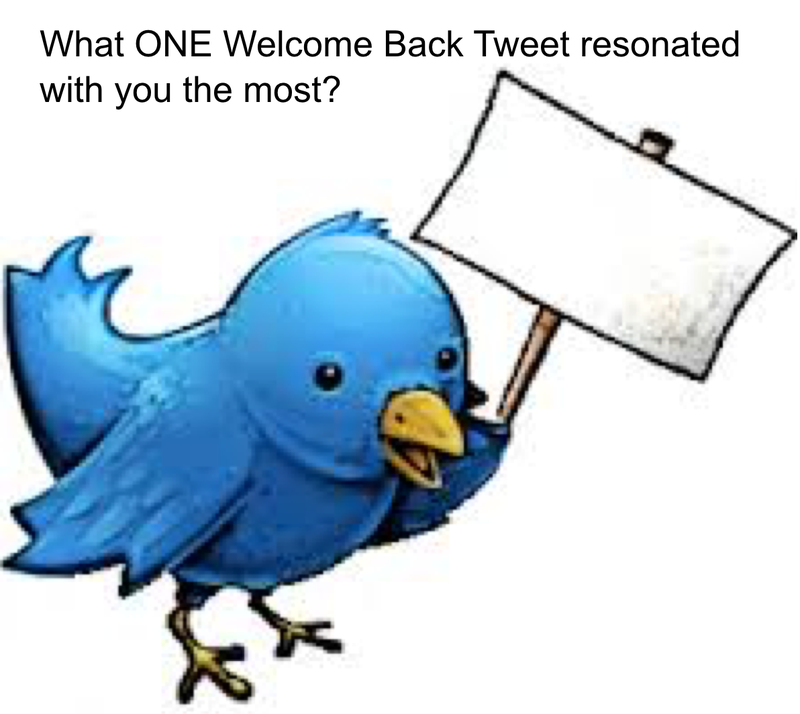 During math, we’ll work to organize and analyze all of the data based on our “GLOBAL Welcome Back”.